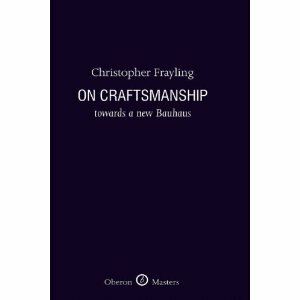 Sir Christopher Frayling was chair of the Arts Council from 2004-9 but before that stint he was chair of the Crafts Study Centre for over 20 years. He has just published a new book "On Craftsmanship" I have ordered it and await eagerly. "I was at a seminar the other day – at no. 11 Downing Street – on Franklin D. Roosevelt’s Work Progress Administration Artists Project, part of the New Deal – of the mid-1930s, and its possible lessons for the arts and arts education in Britain during a deep recession. There were presentations about how far-sighted President Franklin D. Roosevelt had been, and about the resulting public works created by visual artists – craft-works from many traditions, murals, photographic surveys, paintings of social life – at that time. The ensuing discussion focused on the arts as morale-boosters, as statements of confidence, as contributions to national reputations at a time when these reputations had/have been severely dented, as employment and as stimulants of the creative economy. The discussion irritated me, though, because it assumed that the public sector for the arts and arts education in Britain had everything to learn from FDR and the American example when its real significance is that it happened at all in the context of minimal public investment either before and since. Actually, the British system of public funding of the arts/arts education still remains the envy of the world. A ‘mixed economy’ system, rather than all private or all state. We should be less defensive about saying so. And then, the discussion at the seminar turned to public support for the arts and arts education during a recession – and the general view was that support for them was particularly important in difficult times. For all the reasons the ‘New Deal’ was significant in the mid-1930s, and many more besides – including the relationship between the arts and the creative industries. One or two people talked about leaky garrets and how art thrives on adversity and how the recession will purge the excesses of the art scene: you always get that sort of talk, from people who never get to meet artists. But the consensus was that the arts should be encouraged to move centre stage at this time – and especially the up-and-coming generation of artists. The biggest legacies of the Works Progress Administration Artists Project of the mid-1930s have names such as Jackson Pollock, Philip Guston, Mark Rothko, Willem de Kooning, Orson Welles and Walker Evans. A speech I gave, as Chair of the Crafts Study Centre in June 2004, five years ago, took place in very different economic circumstances. In those days, Design and Technology in schools still involved a strong measure of making – the ‘C’ had only recently been dropped from ‘D’ and ‘T’. There were many books still in print about the importance of the crafts in general education. Craft or applied art courses at undergraduate level – teaching the students recently coming off those programmes in schools – were thriving. The Crafts had become a category of its own within the government’s mapping documents of the creative industries. And their contribution to the economy was in the process of being measured. This turned into the Crafts Council pioneering survey Making It in the 21st Century – which looked at the life and work of 32,000 makers – and it concluded that craft is a booming industry that was at the time worth over £800 million: up to then, its scale had been based on out-of-date figures dating from the 1980s; now that was put right. And the crafts had definitively joined the lifestyle pages of magazines and newspapers (and sometimes even ‘makeover’ programmes on mid-evening television – for better or worse), and critics had started writing in books and articles about how the crafts – their ‘aesthetic added value’ – had moved beyond traditional forms of tacit knowledge to playing a full part in the wider culture and society. The stand-up comedian Johnny Vegas had said that was much more proud of having a teapot in the V&A than of winning major awards for being a comedian. And Turner prize-winner Grayson Perry was shortly to offer the very challenging thought “I think the art world had more trouble coming to terms with me being a potter than with my choice of frocks … If you call your pot ‘art’ you are being pretentious; but if you call your shark ‘art’ you are being philosophical”. So, my speech in June 2004 was optimistic. Since then, some things have got worse, some better. ‘Making’ has seriously declined in schools – you can now go from the end of primary school to the beginning of university without experiencing any 3D making at all. The art room, yes. The craft room, no. And yet, as many education specialists have written, the crafts are particularly – maybe uniquely – good at developing ‘the intelligence of feeling’, a fusion of head, hand and heart. Some wonderful courses – especially in the post-1992 universities – have been closed or threatened with closure, most recently Harrow – to make room for more screens, less teaching, less resources, more research – sometimes a euphemism for bad art and craft – and above all more students crammed into the vacated space. The transition from polytechnics to universities, and their rapid expansion, was not very good for the crafts which are difficult to theorise and impossible to mass-produce. I sometimes fantasise about a Victorian-style tableau of a young person standing in front of a fearsome-looking examination board and being asked “And when did you last see your tutor?” And some good ideas for contemporary craft galleries around the country have not come to fruition. I can remember the optimistic discussions about this at the Arts Council, when the lottery still supported big capital projects. And now the golden age of the lottery has gone. But there’s good news too. Good news that people have at last begun to realise again the importance of making at all levels of education – and reports by educationalists are beginning to reflect this. Good news that there has been some fabulous work exhibited in ‘Collect’ and in exhibitions which emphasise ‘the industry of one’ – the overlap of the crafts and high-end design. Good news that there’s a new seriousness in the air again – rather than always producing knick-knacks for rich people. And above all, there’s been the general realisation that the crafts are about today and tomorrow as well as yesterday. The first Bauhaus manifesto of 1919, the one with the Feininger woodcut of a cathedral on the cover, began with a clarion-call to artists, architects and designers: “we must all turn to the crafts”. British translations of this manifesto almost invariably translate the phrase as “we must all return to the crafts” – as if Walter Gropius saw the future as lying in the past. Up until the 1960s, when the Crafts Study Centre was first mooted, the word “return” seemed the right one to use of the crafts. Their image, in the public imagination, was one of nostalgia, ruralism and a pre-industrial world. Amongst professional craftspeople, the Arts and Crafts Movement cast a very long shadow indeed. Now all that has changed. The word “return” has definitively made way for the word “turn”. Crafts are now associated with urban living, interior design, with the shifting borders of art at one end of the spectrum and design at the other, with all colours of the rainbow and with the outer limits of function – to use Alison Britton’s famous phrase. What distinguishes them, makes them highly visible, is the care with which they have been made, the fact that they have been made by one human being for another, the individual ‘take’, the use of materials and the thoughtfulness of their design: design with attitude. They can represent an ethical statement, but they needn’t. And so the things that held the crafts back have largely gone. There are still debates about the word ‘crafts’ and parallel muddles about where the crafts ‘sit’ exactly – with a proliferation of subdivisions which would make even Polonius dizzy: the crafts, the decorative arts, the applied arts, makers, designer-makers, artist-craftspeople. Closer to design or closer to art? But these are now seen, I think, as a range of possibilities rather than as inhibitors which is how they used to be seen. The crafts are a spectrum, and the more inclusive and varied and versatile the better. It has become more important than ever to draw attention to this, at a time when crafts and materials-based courses in colleges and universities are seen as too heavy on resources and at a time of recession, like that seminar about FDR I mentioned. Actually, there are fascinating and important cross-overs to be explored between the crafts and digital technologies – a way of reuniting the crafts, maybe, with manufacturing and with ‘industries of one’, where they also touch the design world. But it doesn’t always happen that way. When the ‘C’ was dropped from ‘D and T’, something important may have been lost. We’ll see." I don't know why but I have never visited the Crafts Study Centre or been very aware of it's work. Edmund De Waal just retired as Chair to be replaced by my friend Glen Adamson so I must pay a visit.